It's time for some behind-the-scenes Nature Geek info. Every week when I publish a new post, I geekily sit here and watch the metrics on my blog. It's kind of like stalking...from the other side. I watch to see how long it takes for the first person to read the post, and how many people read my post within an evening (the answer: literally tens of you). I can also look at the all-time history of my blog to see which posts are the most popular. I moved my blog from Facebook to Blogspot in October of 2011 and since then my top posts have received about 150 to 400 views. However, even my #2 most popular post of 420 views, "Test Your Turkey Trivia!" is a drop in the bucket compared to my most popular entry, "It's Always Halloween in the Natural World." How many views has it received? 17,172! And the reason? People Googling for this picture of the Japanese spider crab. This is one popular crab. So just what is the fascination with Japanese spider crabs? I decided to find out. Let's start with the obvious: its size. Japanese spider crabs are the largest and longest lived of all crabs, with a lifespan of up to 100 years and a legspan of up to 13 feet (4 m). 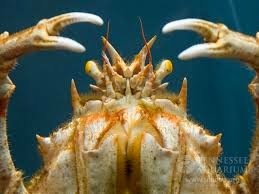 Just imagine a crab able to straddle your bed and peer down at you with its beady eyes. However when you look at the body alone, it's really not that large. Sure, it can be about the size of a basketball and weigh up to 44 pounds (20 kg), but when you consider the heaviest American lobster ever recorded was of equal weight and its total body length was only around 2 feet (0.6 m), the Japanese spider crab is really a lightweight. Typical of crabs, the Japanese spider crab is a scavenger. They roam the ocean floor, down to a depth of up to 2500 feet (800 m), feeding on animal carcasses they come across. Stories have been told of spider crabs feeding themselves with the bodies of those who have died at sea, which in reality is quite plausible. But with their reported gentle nature and relatively small front claws, a Japanese spider crab isn't exactly going to pull you out of your boat (plus again the crab is a scavenger, not a predator). If there was a crab that I would be afraid of coming after me, it would be this guy, the coconut crab. 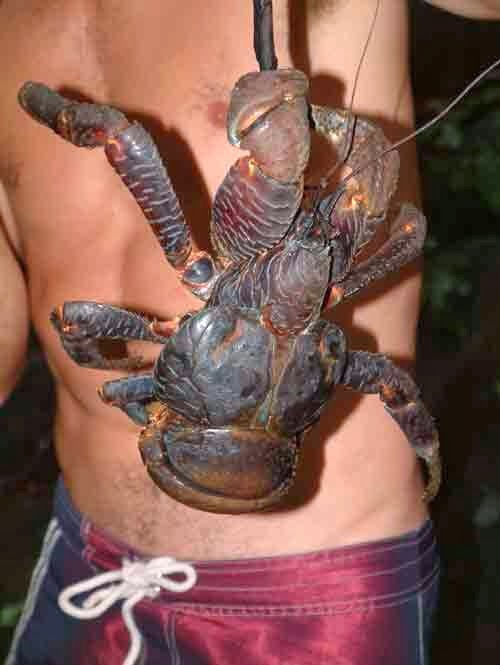 This man looks like he's about to get a nipplectomy from that coconut crab. If the Japanese spider crab were to enter a Miss Benthic contest, it would surely win. I mean not only would it clearly have the best legs in the competition, but it has a pretty good platform as well. 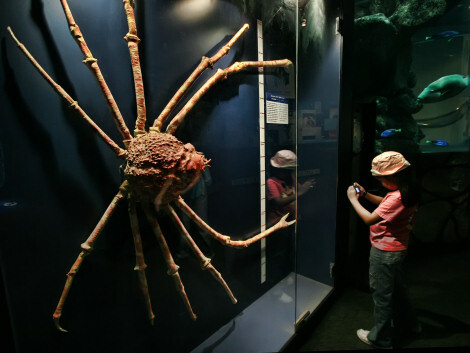 With those long legs, Japanese spider crab tendons are often used in research. There is even research being conducted right now on using the crab's tendons for nerve regeneration. That would most definitely beat out the platform of the hagfish, which is "copious slime production for all." The next Miss Benthic? I think not. So there you have it, Japanese spider crab lovers, some information on your favorite crustacean. Thanks for stopping by my page and while you're here, post a comment on just what teacher out there is obsessed with research papers on spider crabs; I'd really like to thank him or her for driving traffic to my blog. I admit it. I was drawn by the hagfish slime. BTW, the "Are you sleeeeepy?" comment is brilliant!! Thanks for some great blogs! And thank you for reading! Hagfish slime really is something else, isn't it? You are correct, I found this site by googling "Japanese Spider Crab". Hi Scott, and thanks for stopping by! So what got you interested in the Japanese spider crab? Yup, same here! wonder if anyone else came across this blog after watching markiplier's soma playthrough - some commentors suggested that the deep-sea creatures encountered in the cave system toward the end of the game were spider crabs, though they appear to be wrong about that, based on size, depth of habitat and more. is the coconut crab more dangerous? Hi Yvenson! I just discovered that Blogger stopped notifying me about comments during my blogging sabbatical--ugh! To answer your question, I really don't know that I would consider any species of crab "dangerous." Some, like the blue crab, may be more feisty than others, but I don't know of any crabs that seek out and fully attack humans. The coconut crab is the one being attacked, sadly, and has suffered so much from hunting from humans that has needed protection in some areas. Too Dark, Too Light, or Just Right? Can Woodchucks Really Chuck Wood?